Prince Liam. Prince Frederic. Prince Duncan. Prince Gustav. You’ve never heard of them, have you? These are the princes who saved Sleeping Beauty, Cinderella, Snow White, and Rapunzel, respectively, and yet, thanks to those lousy bards who wrote the tales, you likely know them only as Prince Charming. But all of this is about to change. Rejected by their princesses and cast out of their castles, the princes stumble upon an evil plot that could endanger each of their kingdoms. Now it’s up to them to triumph over their various shortcomings, take on trolls, bandits, dragons, witches, and other assorted terrors, and become the heroes no one ever thought they could be. 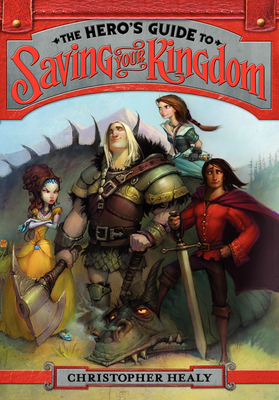 Christopher Healy’s Hero’s Guide to Saving Your Kingdom is a completely original take on the world of fairy tales, the truth about what happens after “happily ever after.” It’s a must-have for middle grade readers who enjoy their fantasy adventures mixed with the humor of the Diary of a Wimpy Kid books. Witty black-and-white drawings by Todd Harris add to the fun.